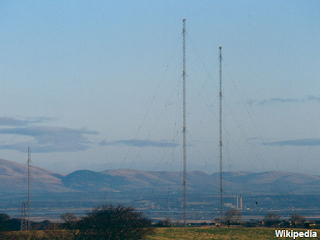 Listeners to the BBC's analogue radio services on AM in Scotland will be affected by maintenance work at the Westerglen transmitter site in Falkirk. The transmitter primarily serves the central belt of Scotland. Services from the site have already been interupted during the past week due to regular maintenance work at the site. Now it has been confirmed that from 30th July through to the 23rd August, BBC Radio 4 on 198 LW in Scotland is liable to be affected by reduced power, although other transmitters making up the Radio 4 LW network will continue on air as normal. Work is due to take place between 10:00 and 16:00, subject to weather conditions. BBC Radio 5 Live on 909 kHz MW and BBC Radio Scotland on 810 kHz from Westerglen are subject to shutdowns during the day until 19th August 2015. All affected services continue as normal on DAB digital radio, online, via Sky, Freesat, Virgin Media and Freeview.